How about a skirt? Men in skirts. Could I as a man wear a skirt? 1. The existence of utility kilts with their non-defined designs is already part of the answer, so YES, under circumstances you can. And why should a kilt or kind of kilt be the only possibility? In fact, the first Utilikilt, the Original Standard, was technically a skirt, even if called a kilt. It didn't have a front apron, but was closed by means of a zipper on the front, like jeans, and was pleated all way round. A hybrid, you might call it, of a kilt and a pleated skirt. A little later they launched the Utilikilt New Original, but for some years you had a choice between the “skirt” and the “kilt”. The Utilikilt Standard was pleated all way round, and it was a closed skirt with a zipper on the front. Same thing with the Mountain Kilt from Mountain Hardwear. No pleats at all and rather narrow. 2. You can find numerous pictures on Pinterest, showing men wearing skirts in an absolutely manly way. And even more should do, no doubt, and more often, were they just men enough. You can tell from men-in-skirts forums in English, German, French, and other languages. Kilts are not to everybody’s taste. Instead they will wear a skirt, but for the same reasons. 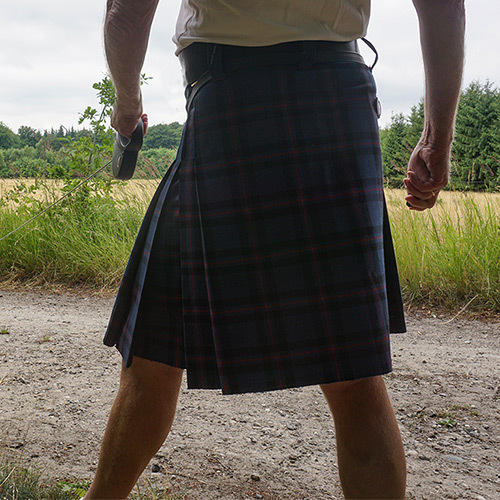 There are also kilt wearers who will sometimes wear a skirt, they have revealed on otherwise strict kilt-forums, be it for variety, or because a skirt is better for certain tasks or in certain situations, like on a very hot day. 3. Men in skirts are per se not contrary to nature. Men have earlier been wearing skirted garments, without being accused of being or appearing femme. In some parts of the world they still do. Jesus never wore trousers, Socrates didn’t. 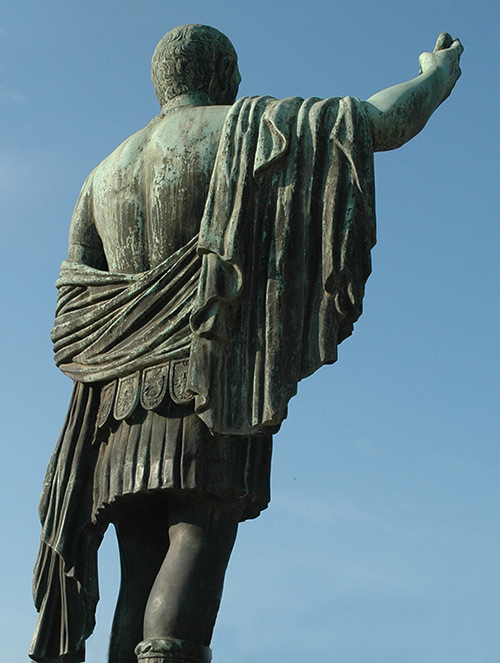 When Emperor Augustus declared that the “World” should be counted, Roman men and boys were wearing mini-skirt looking tunics or long dress-like togas. The Roman Empire was built by men in skirts. Trousers were not invented with the purpose of having men look more masculine but because trousers were more practical for a lot of tasks, those being fewer in today’s world. Men in 'skirts' built The Roman Empire. 4. Fashion designers have for years been positive regarding skirts for men. Jean-Paul Gaultier, Marc Jacobs, Vivienne Westwood, Givenchy, Yamamato, Dries van Noten, Kenzo and you name it. Every season men in skirts and sometimes dresses are presented on the catwalk. So far, however, without the fashion industry being convinced to give skirts a try, exceptions being H&M and Zara, having between 2000 and 2018 a few times been man skirts, even if rather half-heartedly and with designs hardly persuading men into them, an exception being the ZARA 2018 skirt. It was very nice and appropriate for a man to wear, but only available in two sizes and in very few outlets. In no time it was sold out, what is promising. But imagine how the fashion and clothing industry should be booming, could an entirely new product market suddenly come into existence, comprising half the population, like 60 years ago when women were offered trousers - and embraced them. To make it happen, a critical mass of men demanding manly skirts and them brave enough to buy and wear them is needed. The really big obstacle is that men might be afraid of sacrificing their manliness, should they wear a skirt. Well, women did not lose their attractiveness by wearing trousers. 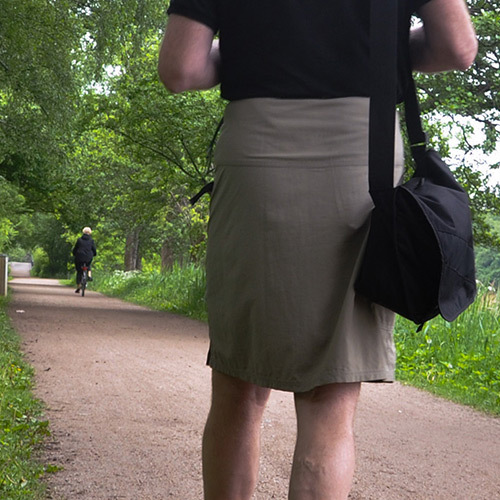 Why should it be different if a man was wearing a skirt? It all depends on the man wearing it and how he is doing it. The major problem probably is that obviously quite many men in skirts will compete with their peers on forums and the like about who has the guts to wear most female items and in the most female way. Men in flimsy skirts and blouses or in dresses, heels and transparent pantyhose don’t sell seats to 95% of the manly population and even less to their wives. They are contra-productive to the idea of men wearing skirted garments. Quite often, it seems, they are misguided by men who must wear female clothes to feel right, or who should like to be women, which it later shows. I think that we that we kilt wearers should benefit, if just (more) men would wear skirted garments whatsoever - provided they would wear them as MEN and in a strictly MASCULINE way - thereby contributing to break down the conception that a man cannot wear anything but trousers. The company was founded in 2008 in Nîmes in Mediterranean France by two French fashion designers, Jennifer Marano and Jean-Guy Béal. Since then they have been designing and making skirts for men. The design of the Hiatus skirts is, compared to most utility kilts, much cleaner and without all the - to me annoying - metal buttons. And the pockets are less dominant. To men, wanting a skirted garment to wear out of a Scottish heritage context, Hiatus Skirts might be worth considering. In 2015 American SkirtCraft launched a skirt. It started out to be a man skirt, but eventually the company decided to position it as a unisex thing. Mr. Kirt a premium brand in men’s skirts might also be worth looking at. A skirted garment tailored to your wishes? If you have an idea about how you should like a kilt or a man’s skirt - your skirt - to look like, you could also go to a tailor and have one made. Actually I have three such skirts which are basically kilt designs, but with pleats only at the sides, none at the rear, they are probably skirts rather than kilts. On a forum it several years ago was debated, how a kilt, should it be redesigned or product developed should look like. Up came the idea of, for convenience, having no pleats at the rear. Following that track one member actually had three “neo-classic” kilts made for him, one being in tartan, made by a German kilt maker, the two others solid black, but in different fabrics and sewn by a dressmaker in Berlin. As he a couple of years ago would no longer wear them, he wrote to me that if I was interested, I could have them for free. I was. They all are 4 yard, 24” long and the aprons are going from hip to hip like on a traditional kilt. The tartan version is closed by means of straps and buckles, the black ones by Velcro and further they are having a deep inside pocket with a vertical zipper. In today’s world they make sense, I think, like I thought when it was discussed how a kilt in future might look like. But until it has been accepted that a kilt can be without pleats on the rear, I agree that they are skirts. Manly skirts. A tailor-made man skirt. Classic kilt design, Elliott tartan, 4 yard wool, but pleats only at the sides. Black, tailored skirts. Identical design but one made of a heavy weight, the other of a light weight fabric. Outside the western world we find the sarong which has its origin in Sri Lanka and is being worn by many men. It is also known under names like kikoy(South Africa), lamba (Madagascar), longyi (India), malong (Philippines), mundo (Maldives), and pah kao mah (Thailand, the version for men). Basically the sarong is a big piece of cloth, worn around the waist as a wrap skirt. And often it is a very cheap garment to be primarily worn on the beach. However, Sri Lanka based em> offers a wide range of more sophisticated sarongs which looks like being more universally wearable and therefore might better appeal to men in our part of the world. LOVI CEYLON. Skirts - designed for women? A traditional kilt can at all times be explained and understood. And so can a utility kilt, even if not always to the same degree. With a man skirt you at least can claim it to have been made for men, but if you take the step to a skirt from a women's store your reasons might be less comprehensible. Regular skirts you can, in theory, find just around the corner. But you shall probably soon realize that only very, very few skirts, designed for women, are suitable for a man to wear, does he emphasize a masculine appearance. "Boyfriend" style might be a possibility, but it is not always hype and long skirts, fashion 2019, are way too feminine. And then there is the size. Men are bigger than women. And clothes meant for big size women seldom look smart and are often extra feminine to compensate for the size. Also skirts for women may be too short or too long. Now you are warned. A wide skirt (A-line or wrap) with a fly on the front. The fabric should be rather coarse like denim or cotton. A "manly" colour like blue, black, grey, olive, khaki etc. is to prefer. Pockets (even if often not deep enough to be usable are fine too; and so are belt loops. About knee length (like a kilt) should be fine or somewhat shorter. (Because femme) pencil or otherwise tight skirts, slits, light weight fabrics, most patterns, and details only meant for decoration, also skirts closed at the back or to the side. Due to anatomy a man's skirt cannot possible be as short as that of a woman. Too long, and the comfort argument cannot be used. Do I need to say, that you should now and forever forget about high heels, shaved legs, thin transparent tights, and other items connected with women’s wardrobe? It takes more than a proper skirt to appear femme, but not that much more! 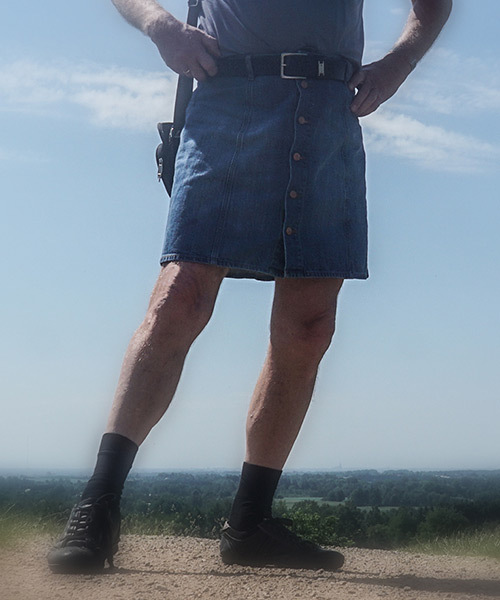 Men might without major problems - at least when among strangers - wear for example denim skirts made for women, provided anything else looks definitely manly, including the aura of the wearer himself. I think that men, putting emphasis on a manly appearance, should better not go any further than to the man skirt. Some skirts designed for women might be OK. But in most cases, leave women's skirts to the ones they were intended for - and to men having no other choice, but to wear female stuff. If or when wearing a regular skirt, make sure your appearance is otherwise strictly manly. That's my opinion, my advice. When in such skirt, stand up to it. It has been your decision, your choice. Never try to excuse that you are wearing it. Never look guilty or like had you a bad conscience. It is not a crime. Show to the world that you are man enough to pull that skirt. Wear it with confidence - even if it cannot beat the classic kilt. Some pictures have been found on the internet, and in some cases it has not been possible to ask permission to use them. If not, they have been edited in order that no person can be identified. Should you have the rights to a photo used here and you don’t want it to be published, e-mail me, and I’ll remove it.